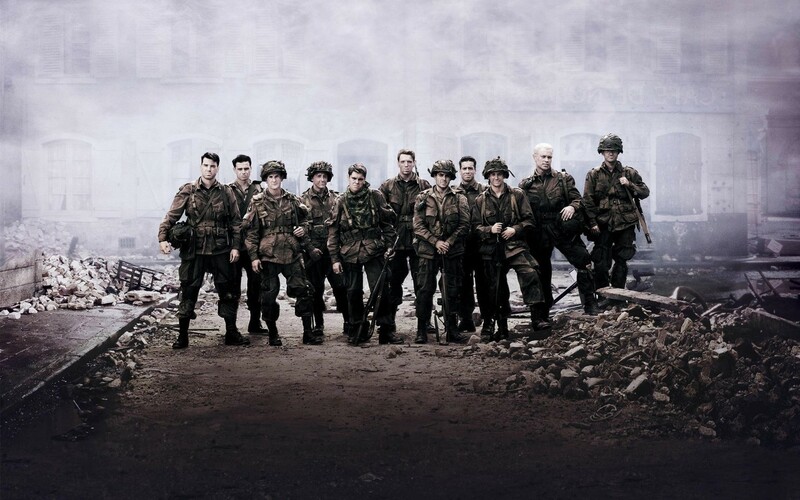 Warrior Wednesday strives to honor those who worked and continue to work to make freedom possible through their dedication, sacrifice and bravery. In 1944, following the support of the Hollandia landings, Task Force 58 begins a two-day attack on Japanese shipping, oil and ammunition dumps, aircraft facilities, and other installations at Truk. Japanese naval aircraft counterattack on U.S. formations. USS Tang (SS 306). 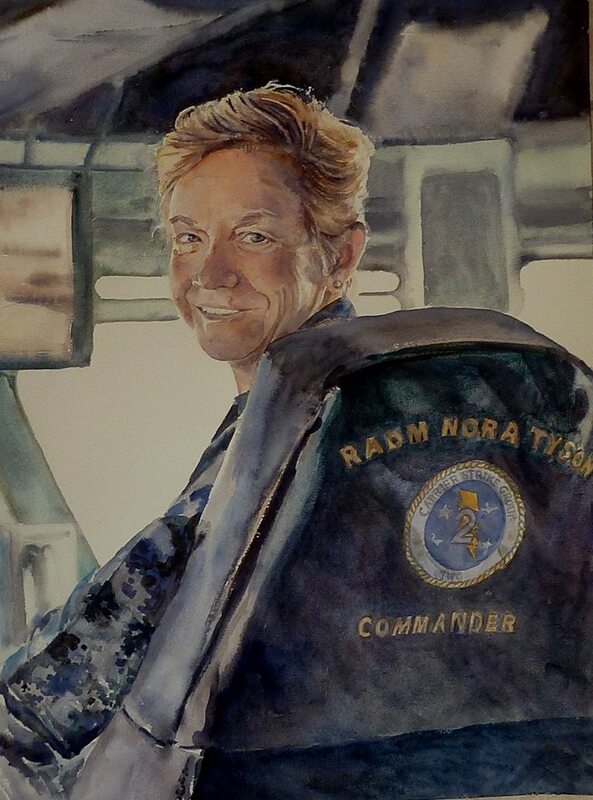 The submarine’s Commanding Officer, Lt. Cmdr. 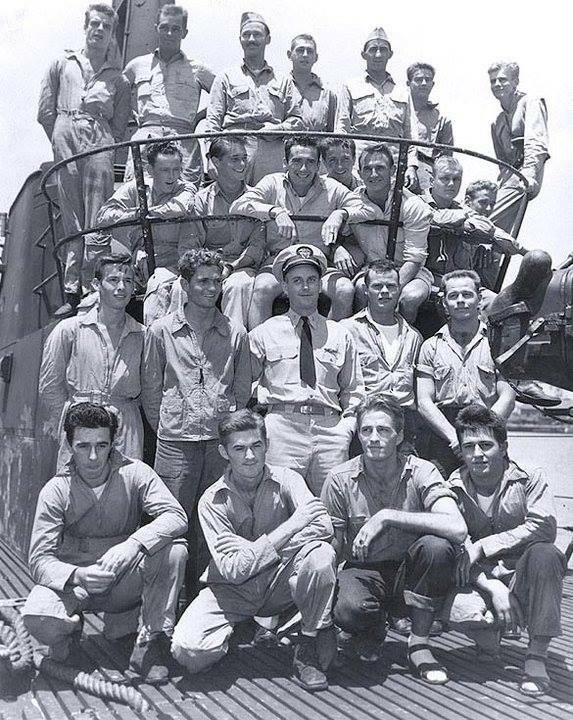 Richard H. O’Kane (center), poses with the twenty-two aircrewmen that Tang rescued off Truk during the carrier air raids there on 29 April-1 May 1944. The photograph was taken upon Tang’s return to Pearl Harbor from her second war patrol, in May 1944. 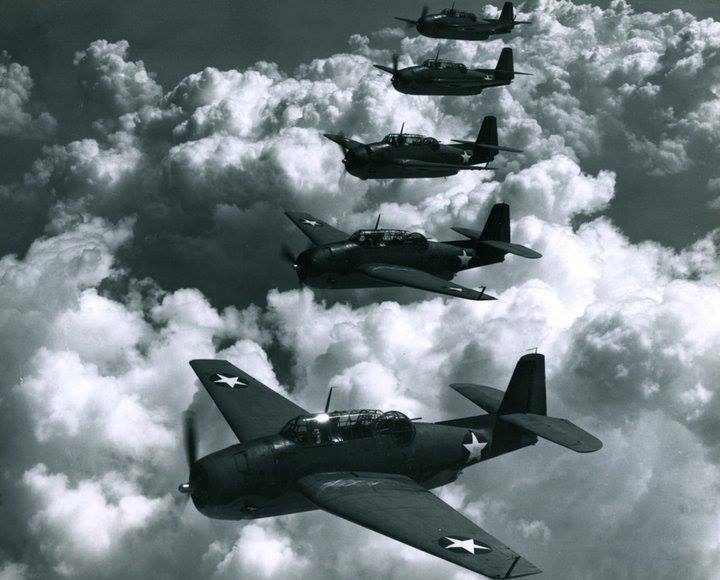 TBF “Avenger” aircraft in flight formation over Norfolk, Virginia. Photograph received September 1942. National Archives photograph, 80-G-426849. TBF aircraft helped to sink Japanese sub I 174 on 29 April 1944. 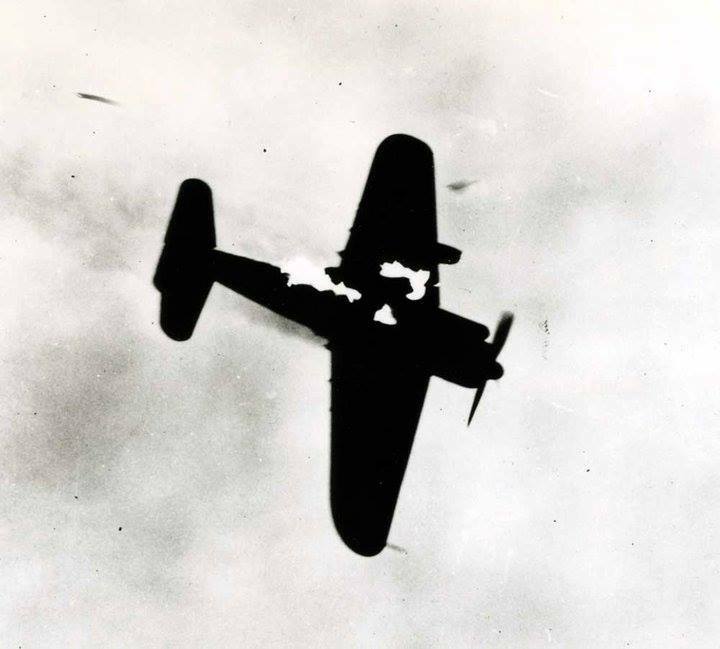 Nakajima B6N2 “Jill” Torpedo Plane begins to burn from A.A. fire hits during an attack on TG 58.2 off Truk. Seen from USS Monterey (CVL 26). Undated, probably taken 30 April 1944, during raid on Truk by TF 58. National Archives photograph: 80-G-366985. USS MacDonough (DD 351). At sea in December 1943. Official U.S. Navy Photograph, now in the collections of the National Archives: 80-G-276746. 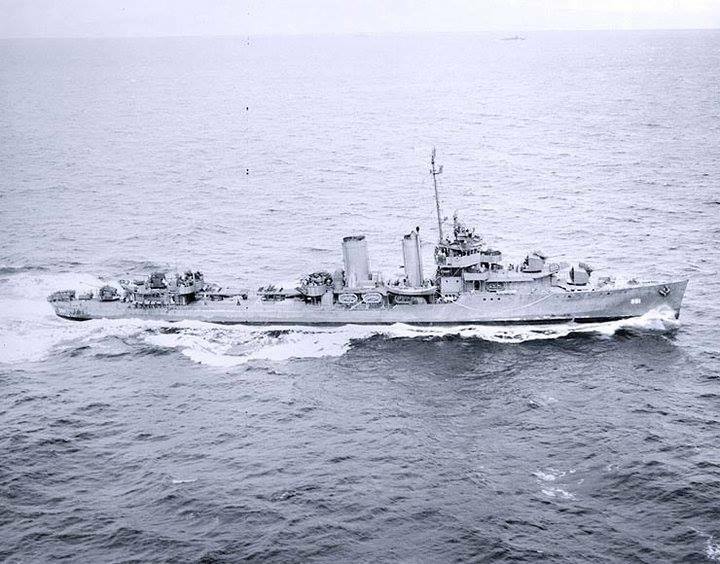 USS MacDonough helped to sink Japanese submarine I 174 on 29 April 1944. Vought OS2U “Kingfisher” floatplane, from USS North Carolina (BB-55). 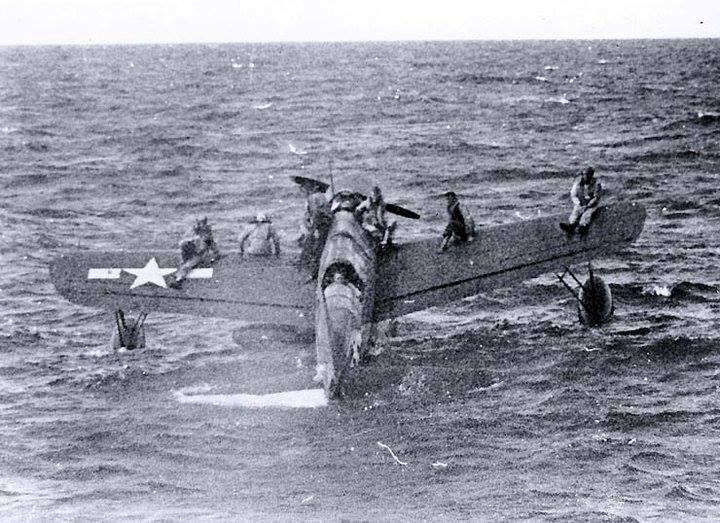 Off Truk with nine aviators on board, awaiting rescue by USS Tang (SS-306), 1 May 1944. The plane had landed inside Truk lagoon to recover downed airmen. Unable to take off with such a load, it then taxiied out to Tang, which was serving as lifeguard submarine during the 29 April-1 May carrier strikes on Truk. National Archives photograph: 80-G-227991. Hvalfjord, Iceland. U.S. and British warships in the harbor May-June 1942, seen from a USS Washington plane. 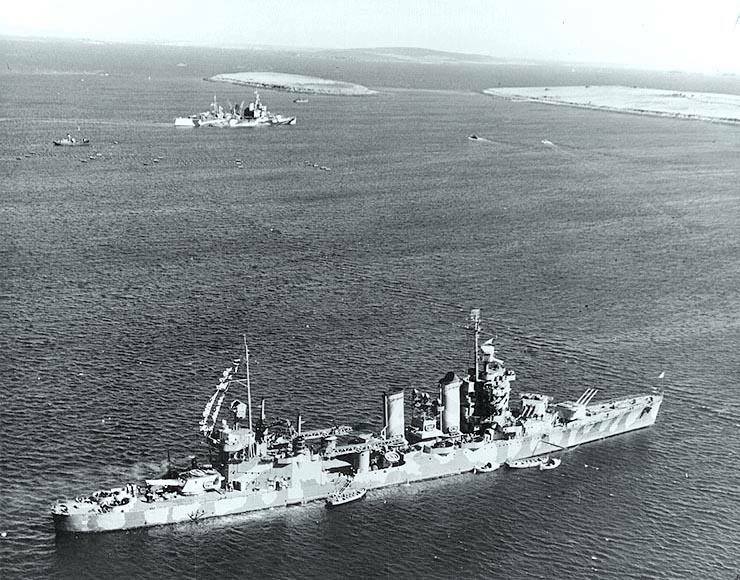 Washington is the ship at left, with USS Wichita (CA 45) and a British Southampton Light Cruiser astern. Heavy cruisers at right are HMS London and HMS Kent (with three stacks). Ship in foreground is probably HMS Norfolk. National Archives photograph, 80-G-24832. 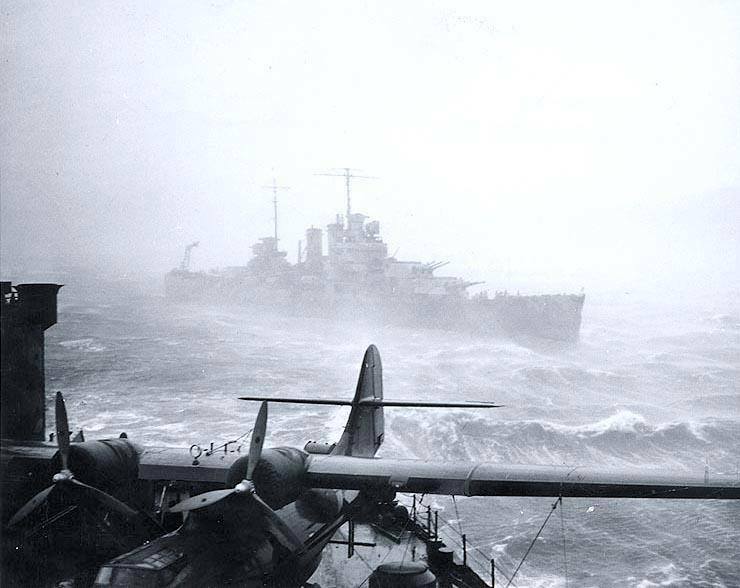 USS Wichita (CA 45), rides out a winter storm off Iceland in 1941-42. Note the PBY patrol plane on the deck of the seaplane tender from which the photograph was taken. NHHC Photograph Collection, NH 97885. 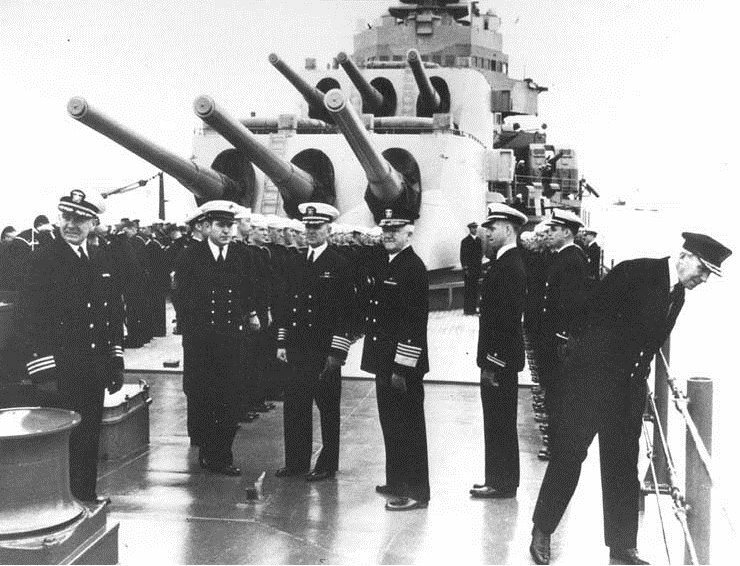 Navy leaders onboard USS Wichita (CA 45), April 1942. USS Tuscaloosa (CA 37). 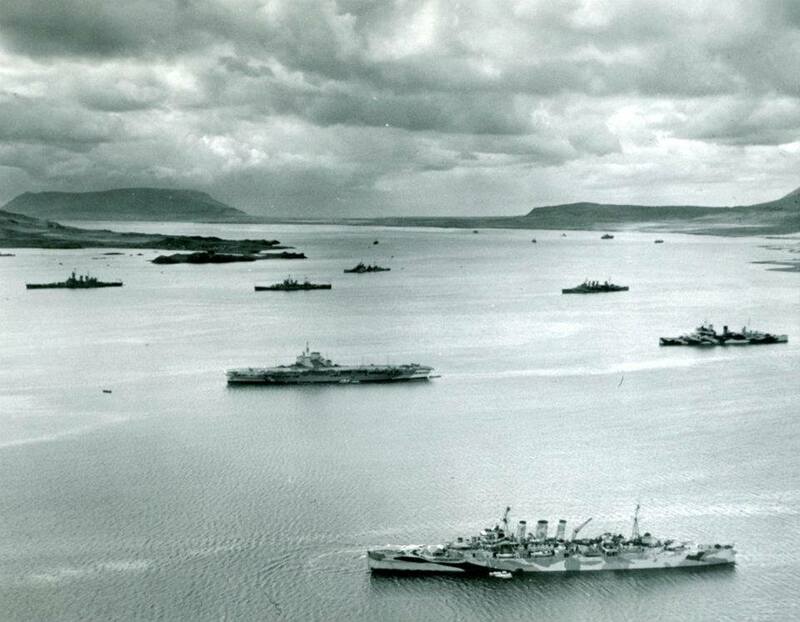 Moored in Scapa Flow, April 1942, while she was operating with the British Home Fleet. The British heavy cruiser London is in the background. National Archives photograph: 80-G-12018. Second only to the Navy Medal of Honor, the Good Conduct Medal is the oldest award the U.S. Navy has continuously presented to deserving Sailors. Prior to the Civil War, when a Sailor completed his enlistment, his commanding officer would certify his time, his trustworthiness at sea, and his proficiency with gunnery. If he wanted to go to sea again, his discharge acted as his references. Back then, “good conduct” was as much about skill than just behavior. A Sailor would enter a recruiting station with his “Good Conduct” report and reenlist. Enlistments worked differently back then compared to today when recruits may have little to no experience sailing. “[The badge] was established by the Secretary of the Navy [on April 26, 1869] for award to any man holding a Continuous Service Certificate, who had distinguished himself for obedience, sobriety, and cleanliness,” according to John Strandberg and Roger James Bender in The Call of Duty: Military Awards and Decorations of the United States of America. Given the reputation of Sailors back then, one could be forgiven for believing the bit about sobriety made the badge difficult to obtain, but there are no statistics available today about what percentage of 19th century Sailors were actually presented the badge at discharge. The badge, which seemed a lot like a medal, was a Maltese cross with a rope-ringed circular medallion at the center. Along the rim of the medallion were the words ‘Fidelity Zeal Obedience’ and at the center, ‘U.S.N.’ Made of nickel and measuring about 31mm wide, the cross hung on a half-inch wide red, white and blue ribbon. On the back, the Sailor’s name was script-engraved. If and when a Sailor received three such awards after consecutive enlistments, he merited promotion to a Petty Officer. The badge underwent some redesigns in 1880 and again in 1884. Then 27 years to the day after the certificate became a badge, the badge became the Good Conduct Medal in 1896. In addition to this, by order of General Order 327, the time criterion was set at three years for a Sailor to earn it. A straight bar clasp was used to attach the circular medal to its maroon ribbon. 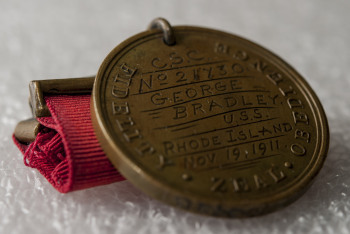 Over the next several decades, the Navy changed the medal’s appearance numerous times, but the criterion for receiving it seems to have remained the same. For a brief period during World War II, the Navy stopped awarding the medal to conserve metal and free the clerks from the paperwork they mandated. Instead, notations were made in the person’s service jacket. Not until the 1950s did the Navy settle on something permanent. The clasps were done away with in favor of 3/16 inch bronze stars denoting multiple enlistments, names on awards were dropped for all but posthumous recipients, and the ribbon was changed to a solid red color. 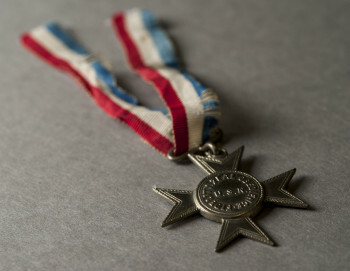 Nowadays, the rules for earning the medal are a little more complex, but generally if Sailors go three consecutive years with “a clear record (no convictions by court-martial, no non-judicial punishment (NJP), no lost time by reason of sickness-misconduct, no civil convictions for offenses involving moral turpitude)” they are eligible for the Good Conduct Medal.